Just what the ST universe needs: yet another karate contest! The Karate Kid Part II is a nice looking, multiscenario action game closely linked to the Ralph Macchio/Pat Morita movie of the same title. As in the film, the player (cast as Macchio's "Daniel") is no longer competing within the comfortable confines of a school auditorium. This time, he's told, there are no trophies, referees or points. Then how do you know who wins? "Whoever dead," explains Morita's character, "doesn't." This all sounds very nice, reader-san, but in context of the actual game, it is meaningless. No points, you say? Of course there are; they simply are not tallied on-screen. No referees, eh? But the combatants are still limited to the sixteen legal moves that can be entered through the joystick or keyboard. The program attempts to follow the film and introduces several bonus sequences right off the celluloid. 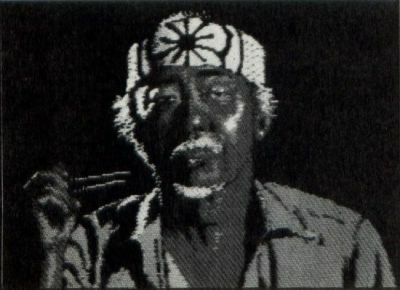 In one, Daniel must break a block of ice with his naked appendages (his bare hands, that is); in another, the player inexplicably becomes the Pat Morita character and must capture an annoying housefly with a pair of chopsticks. The graphics in both these sequences are "striking," but in terms of game play, the chopsticks-vs-fly gambit is a bit of a bore. Background graphics throughout are beautiful, taking full advantage of magnificent Japanese scenery. The foreground sprite animations, however, are rather diminutive. The smaller an on-screen character, the more limited its body articulation; in a martial arts game, where subtle body movements must be clearly distinguishable, larger characters are needed. Karate Kid Part II is another nice-looking karate game, despite a few rough edges. If your thirst for martial arts hasn't already been slaked, this may be your cup of tea.